The Triage Training System (TTS) provides a simple, mobile way to dynamically manage large groups of “victims” in a mass injury simulation by providing individual instructions on how each “victim” should act based on their unique injury. The TTS also simulates life signs such as a pulse. In addition, it simultaneously collects “treatment” data on how each of the victims were assisted (pulse and airways) and sorted in real time by the medics. 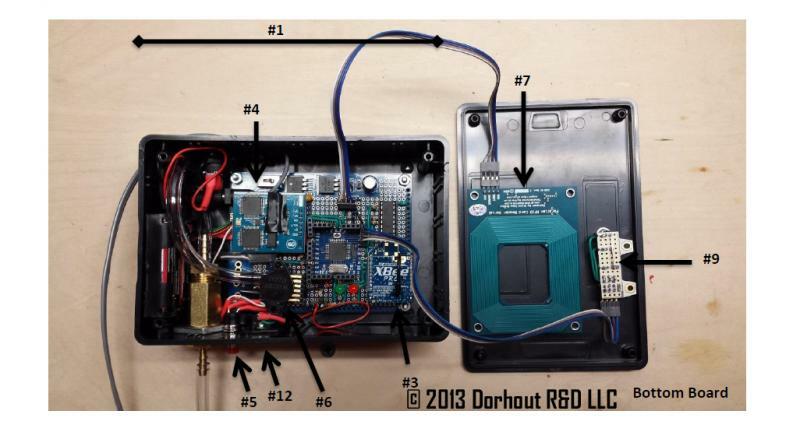 This new system is more cost-effective than current methods because it: 1) Reduces training preparation time for both coordinators and participants, 2) Allows everyday actors without specialized medical knowledge (wider pool of actors) to portray realistic scenarios, and 3) Uses off-the-shelf technology to build the devices which saves costs associated with custom hardware. 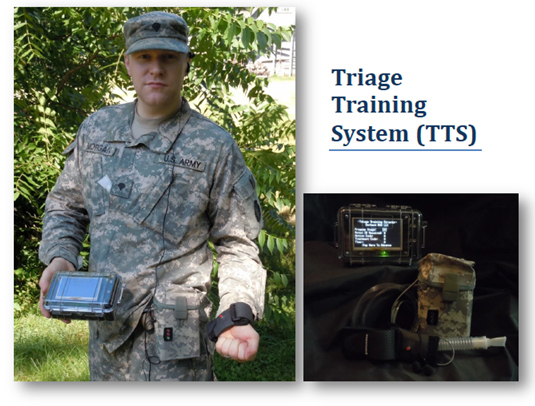 The Triage Training System has two main parts. The first system is the “Acting Coach” that each actor playing a “victim” wears and the second system is the “Coordinator’s Tablet” that the coordinator uses to direct and manage the simulation. The small form factor and rugged design of the Acting Coach allows for more realistic simulations under inclement weather. The simplicity of design and interface allows for less “training the victims” and more “training the medics” than current methods while simultaneously allowing for more complex scenarios that have multiple phases just like real disasters. 2) Twelve unique injuries roughly divided into three groups (Airway, Circulation/Bleeding, Shock/Nerves system) of switches with four levels of severity located on the top board (image to the Right). The coordinator just selects which injury(s) they want for that scenario. The Triage Training System is a simple, cost effective way to train first responders in more realistic scenarios than are currently possible. The Acting Coach quickly gives the actors (playing the victims) the ability to convincingly play their parts without having to spend hours going through training and trying to remember their symptoms or to have specialized medical knowledge. All they have to do is wear the Acting Coach and follow the verbal instructions given to them via the inconspicuous ear bud. They no longer have to break character and read “cheat sheets” or guess. In addition, the Coordinator’s Tablet allows the coordinator to walk covertly throughout the scenario, monitoring and recording the progress of the medics and secretly advance the scenario without having to resort to announcing everything through a radio or loud speaker, breaking the realism of the scenario. Future iterations of the Acting Coach could include functional wounds with realistic bleeding and the Coordinator’s Tablet could be easily equipped to trigger environmental events such as simulated explosions.